Think of your music, video and pictures. We used to talk about data in terms of kilobytes, or 1000 bytes. Then megabytes, or 1000 kilobytes became the norm. Now we routinely transfer and walk around with memory sticks than hold gigabytes, or 1000 megabytes. And it's not uncommon to find home computers these days with drives that handle terabytes, or 1000 gigabytes, which, coincidentally, is the same as a trillion. In taxes, huge number: in footage of your vacation, not so much. All this to say: stay tuned for photos. A helluva lot of them. A "communist" country, it's also a place where locals will gladly alleviate you of your dong (the local currency)...or dollars, or euros, or anything else, in exchange for whatever they have on offer (which is everything). It's not uncommon to be initially quoted a price 5 or 6 times the appropriate amount, only to bargain a little, walk away, and finally get a fair deal. The traffic is the craziest I've seen since my trip to India, except unlike in Delhi, here the steady stream of motorbikes (with a few bicycles and a few cars mixed in) flows like a choreographed dance full of near-misses and complicated groupwork in close quarters at breakneck speeds. I'm astonished to only have seen one minor accident, from which the two involved parties walked away unscathed. Yes, that is exactly what it looks like. A farmer, with his water buffalo, plowing the rice fields...talking on his cell phone. - Visiting the Cu Chi tunnels outside Saigon. The Viet Cong built an extensive network of tunnels connecting their underground bunkers outside of Saigon. With the weapons flooding in from the Ho Chi Minh Trail and Viet Cong embedded all over South Vietnam, it's hard to imagine how the U.S. ever felt that this was a war they could "win." That's another story. 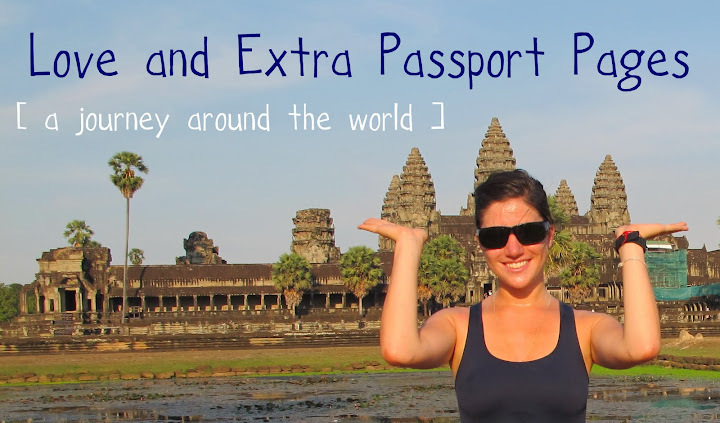 - Riding on the back of xe om - motorbike taxis - everywhere! Motorbikes abound in Vietnam, and in the cities you'll see more of them whizzing by than all other forms of transport combined. Legally, drivers and "passengers" have to wear helmets here, so when you see a guy smoking a cigarette, sitting on his motorbike by the side of the road, with two helmets slung over the handlebars, you start bargaining. Can you spot the sweaty foreigner? - Dinner with a lively and lovely group of expats in Hanoi...was introduced by the illustrious Felicia to her high school friend Jimmy, who kindly invited me and dad to tag along for the evening's activities! Enjoyed delicious food and delicious conversation. - Visiting "Uncle Ho," better known as Ho Chi Minh, in his embalmed state in his mausoleum. What a trip! Literally thousands of visitors, the vast majority of whom were Vietnamese, lined up and waited for hours only to be ushered through the viewing room in a matter of moments. Our guide said there were more visitors today than he had ever seen in his life (the combined effect of it being a weekend, and the kickoff of summer holidays for Vietnamese schoolkids). Official rules inside the mausoleum: No cameras. No hats. Long pants. No sunglasses. No hands in pockets. No hands behind back. No talking. Unofficial rules while waiting in line for the mausoleum: Do not keep your place in line. Cut ahead of the people in front of you at every opportunity. Push/prod/graze the person in front of you until they look around giving you the opportunity to overtake them. Tomorrow we had to Halong Bay for what promises to be a scenic farewell before dad heads back to New York. Thanks everyone for your comments! It makes me feel so great to know that there's actually someone out there reading this thing. And to that end, I am going to try to make my posts more frequent (though perhaps a little shorter to facilitate said frequency). Until then, sending love from Vietnam. When the photographer Philippe Halsman said, “Jump,” no one asked how high. People simply pushed off or leapt up to the extent that physical ability and personal decorum allowed. In that airborne instant Mr. Halsman clicked the shutter. He called his method jumpology. Jumping has been a bit of a theme. Talia, my South America travel buddy from Canada, and I took dozens of pictures leaping, jumping, and generally attempting flight in front of various and sundry landmarks in Argentina and Uruguay. I have continued Talia's tradition, and myself have been getting a bit of air across Australia, Singapore, Indonesia, Cambodia and Vietnam (!). To that end, I'm building a Picasa web album called "Jumping around the world". Check it out here. Before I visited one, the words "floating village" conjured, for me, an enchanted hamlet, magically adrift on a glittering river. In reality, the community living outside Siem Reap on Tonle Sap, while visually striking, was very sad. The very act of visiting felt strange. Ben and I left the comforts of the River Village Manor, our lovely guest house, with our guide, Kerri. Thirty minutes in the tuk tuk later, we had passed progressively less and less elaborate homes lining the road. Just before we reached the dock where tours leave for the floating village, we saw a huge tract of land that had been cleared...Kerri informed us that there are plans to build a 5-star hotel there. Well! That would certainly change the "vibe." We paid a man in a hut and then walked down to a small fishing boat and began our journey out to the center of the lake. The river is extremely shallow in parts, so our boat driver would climb on the bow and push us along with a long stick that he wedged into the mud, gondolier style. I thought our boat was rustic enough, until some actual fishing boats zoomed by (often sending the muddy low-river-tide water sputtering into our boat)...then I saw some additional tourist boats returning to the dock - just like ours, fitted with plastic chairs and a roof and thin plastic sheeting that could be lowered to protect tourists and their expensive cameras from the muddy sprays of the 'real' boats. All of a sudden, there was a child at Ben's shoulder, standing on the edge of the boat with an ice bucket full of drinks: "Cocacolasodacoldwater?" he asked. After the initial shock Ben declined, and looking down over the side of the boat saw that several small boats (essentially canoes with motors) had sidled up to ours to offer us, the tourists, cold drinks. Children would jump on and off the tourist boats as their drivers (could it be a parent?) maneuvered around the widening section of the lake. And then the mouth of the lake opened up and deepened and we were in the "village." I'm not sure what to say of the village. I didn't get a chance to talk with the people who lived there...and part of me thinks, that's a good thing. To have their day to day lives be a tourist attraction is enough of a disturbance without having curious outsiders like me come knocking and saying, "so what's life really like here?" There's a central dock where tourists are let off, given the opportunity to spend more money (drinks, souvenirs), and where more teams of child and parent zero in on tourists in their boats. The girl in the first photo is one of these kids. They jump onto the dock with snakes around their neck and adorable smiles, stare right up at you and open their hand while repeating, seemingly, the only English they know: "One dollar." Ben had brought his guitar, so instead he sat down and played a song for them. The children seemed to like this - they communicated that they were listening with smiles and furtive glances at each other, before resuming the "one dollar" chorus. And then we just sat there, for half an hour. Ben playing songs, and letting the kids (there were 6 or 7 of them now) strum while he held down chords. I realized that taking a photo would prompt more requests - "one DOLLLLLaarrrrr!" - so I snapped a few without anyone noticing and then sat back and enjoyed the music. The kids seemed to, too, though their mothers looked a bit wistful, a bit disappointed that we were not obliging with our dollars. It's much easier to look at ruins - buildings - places that have been long abandoned by humans - that to look at people - and sadly, "looking at" was the encouraged verb. I'm glad we went. I think it was a treat for those kids to be allowed to stop saying "one dollar" for a few minutes, and watch, with what was once described to me as awestruck wonder, a white dude in a hat sit down, hang out, and made beautiful sounds. If that's not the very essence of music, I don't know what is. 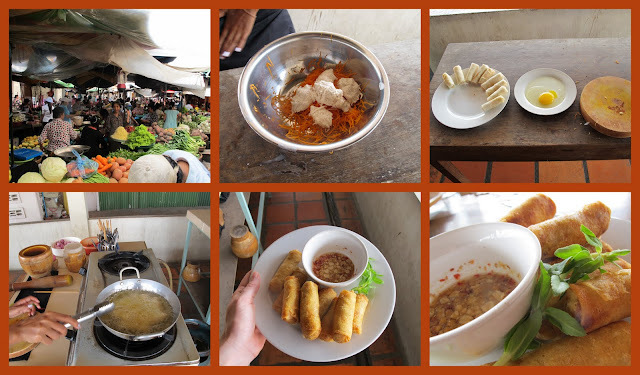 Today I took a Cambodian cooking class at the aptly named Cambodia Cooking Class school. They can accommodate up to 10 students, but today I was the only one. Lucky! 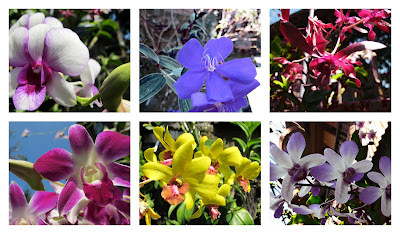 My "photo" of the day is actually six photos that I've collaged together. Six steps to delicious, crispy spring rolls. I'm eager to show off my new skills when I get home, so look out for your invitation to hors d'oeuvre, Cambodian style! Step 2: Grate, salt, drain, rinse, drain the taro root. Grate the carrot. Step 3: Rollup the spring rolls using rice flour wrappers. Use egg as "glue" to seal the rolls. This one's from Byron Bay, Australia. Evan, Andy, Eli, and me (behind the camera), back where we started: on the swingset. Still playing, 11 years after Chatsworth. The past few days have been a roller coaster of emotions and reactions to all that is going on around me. After the incredible high of traveling with Ben for three weeks (details coming soon), he left, and I found myself alone in Phnom Penh, a place where it feels like the locals are about as interested in getting to know me as they are in obeying traffic laws, which is to say, not at all. I met a very cool expat through CouchSurfing, and saw a concert sponsored by the U.S. Embassy of a band called Dengue Fever, L.A. natives who play 1960s and 1970s Cambodian pop. The energy in the crowd was joyful and excellent, and I met a bunch of expats, and played chess (we ended in a draw) with one in a local bar/guesthouse restaurant. The next day, I realized that I'd left my travel journal on the table in the bar, after showing one English-speaking local a hand-drawn map of New York City, to explain where he was when he visited (Midtown, of course) in relation to where I lived ("very close to Liberty Statue!"). Realizing the next day that my notebook wasn't in my bag, I called the bar: no answer. I returned to the bar: nothing. Can I speak to the owner? He's sleeping. What time will he wake up? After 2pm. O.K. I called again and spoke to the owner, who promised he and his staff would have a look 'round and call me back either way. He called back: no notebook. I returned again today to ask if anything had turned up: nothing. I went to the closest guesthouse to see if someone had turned it in there: nothing. Then! Joy and jubilation! I got a CouchSurfing message from my new friend, saying that one of his friends had found the notebook! So this is a rather long paragraph just to say: I'm thrilled and thankful to soon be reunited with my trusty travel journal. Big "up" moment. This morning I met Michael, another estadounidense also staying at the Fancy Guest House and decided to tag along on his walkabout plans for today. Turns out he also went to Columbia (!) and is taking a 2-month journey around Asia before returning to New York for business school. Talk about small world! We visited the Choeung Ek Killing Fields, the site of the Khmer Rouge's executions of thousands of Cambodian intellectuals, those with ties to the former/foreign government(s), rebel Khmer soldiers, and the wives and children of all of these (to prevent them from one day seeking revenge). The tour guide's explanations of the various stops along the tour were chilling in their frankness: "this is the mass grave of 400 people" - "this skull shows marks from being chopped with an axe" - "this is the tree against which children were beaten before they were killed." It's quite a harrowing history. I couldn't bring myself to take photos. If I can find some online, I'll post them here. Later we returned to central Phnom Penh to see the Royal Palace and the Silver Pagoda, a set of tourist attractions that stand in stark contrast to the political history of the Khmer Rouge. Beautiful. opulent pagodas in a lush, manicured garden, and plenty of tourists holding up peace signs in front of buildings. Dinner at Friends Restaurant, a place that employs and trains children and young adults who would otherwise be begging or living on the street. Dining for a good cause, and the food and atmosphere were also excellent! So, all in all, it's been more up than down...I'm embracing the challenge of being in a place where I don't speak the language...where "no thank you" rolls off the tongue with ease as I'm offered tuk tuk rides as I walk to or from any and all of the tourist attractions...and where many of those tourist attractions are chilling reminders of evils of the not-so-distant past. I am learning a lot. With love and lots of sweat (97 degrees indoors). To all the Mothers out there, Happy Mothers' Day, and thanks for bein' moms. We arrived in Bali late Saturday night, purchased our visas-on-arrival and waited in a long, long line to have them checked (but! it's a full page sticker in the passport!). Took an hour taxi ride to our guest house in Ubud. The hot, muggy air smelled of smoke - the burning of incense and of garbage. Pairs of helmeted locals whizzed by on their scooters by the dozens. "Like mosquitoes," our cab driver said. In the morning, our host and owner of the eponymous hotel, Oka Wati, asked us what we'd like for breakfast. We ordered banana pancakes and an omelet and the "Indonesian Specialty" nasi goreng, a delicious fried rice dish. "Also you will have fruit," Oka Wati told us. O.K.! The papaya, pineapple and banana came in a lovely little tower topped with shredded coconut and a sprinkling of nutmeg. Yum! It was all pretty heavenly. We spent the day walking around Ubud, getting a lay of the land. Well. I have never been in a place more expressly designed for tourists. Every (I am not exaggerating) yard, a man asks you, "taxi? You need transport?" Your "no, thank you" elicits a "maybe tomorrow?" Without fail. Every 3 or 4 yards, a woman asks you "massage please?" Your "no, thank you" elicits a flyer in your face. Every storefront has a shopkeeper smiling and waving you inside, "come in, just looking!" Nonstop. A long, lazy and excellent lunch at Nomad Cafe - we had an Indonesian sharing menu for two - was the perfect way to cool off. The next day we strolled to the Monkey Forest. I thought, cool, a shaded area, maybe we'll see some monkeys. LITERALLY upon entering there were monkeys everywhere. We're talking 1 yard in from the entrance, and Ben and I just sat down to watch the monkeys cavorting around. 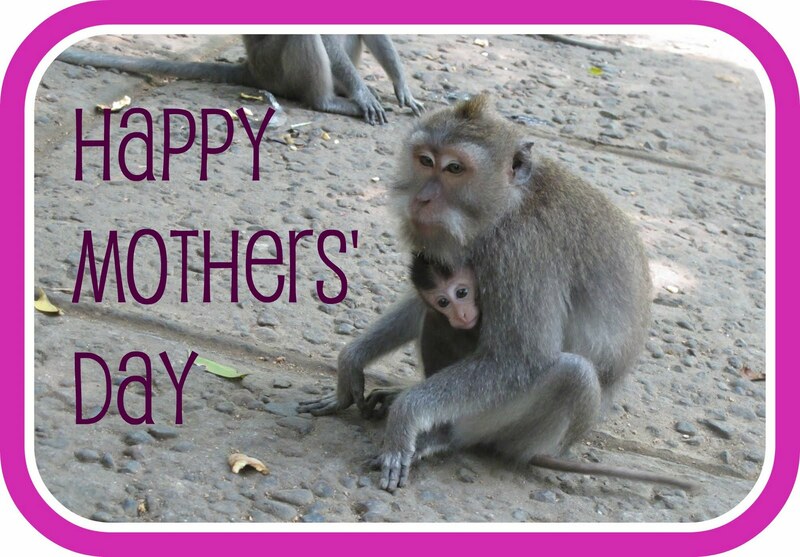 I felt something on my leg, and looked down to see a small macaque monkey draping its hand over my leg. "Ben! Ben! Get a picture!" The little guy then climbed into my lap, posed for a few snapshots, then dashed off. This made me immensely happy. Further into the Monkey Forest, I realized, wherever you sit down, most likely a monkey will come over and check you out. None like that first guy, though. I did have a monkey jump on my head and start social grooming me. One jumped on Ben's head and stole the flower out of his hatband. Another ran off with my sunglasses (a park employee retrieved the glasses). Monkey photos here: Monkey Forest, Ubud, Bali - 1 May 2010. For all of Ubud's delights, we still found it quite touristy. It didn't seem at all like the place where Balinese people might actually live. Tourism ruled the town, so we opted to leave after our short stay for the shores of Nusa Dua. Turns out, Nusa Dua is quite touristy as well! The (according to Lonely Planet) "best Balinese food in Bali" is found there, at a restaurant run by a Swiss guy. Go figure. We did go to the famed Bumbu Bali, though - along with the other tourists who were cheerfully greeted by the entire staff of the open kitchen with a resounding "Selamat malam" (good evening) upon entering. Ben and I had a special dinner in celebration of six years (!) 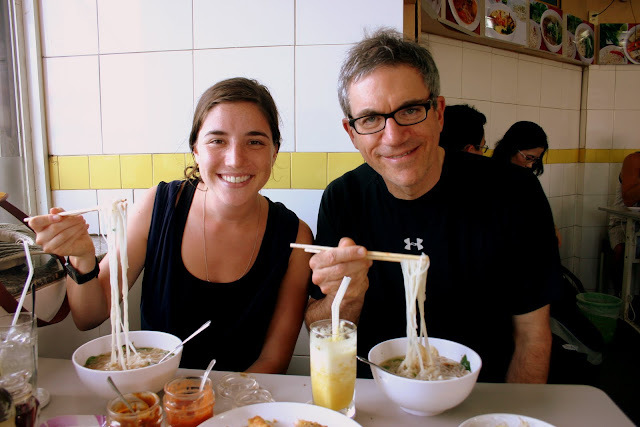 together, feasting on some extremely delicious local fare and sipping Balinese beer. Lovely. We're on the tail end of the rainy season here, though no complaints; while everyone rushed inside for the 20-minute sunshower, Ben and I took a swim in the (super warm - mom, you would go in without breaking stride) ocean. Perhaps this is when I got sunburned, or perhaps while seated IN THE SHADE! under an umbrella, the sun snuck around the edge or just shined right through that thing, but I got Sun Burned. I wore sunscreen! I sat in the shade! The rule is: reapply, reapply, reapply. Even Ben, who rarely burns, turned a lovely shade of bright pink. So that evening, looking like lobsters, we went in search of the famed shellfish and other fruits of the sea of the Jimbaran seafood warung. We taxied (really the best way to get around, unless you want to brave a motorbike) to the beach and chose our meal with a net instead of a menu. The front of the "restaurant" = a grill and a bunch of fish tanks. The "waiters" point to the tanks and tell you about their contents. We had the fish in the photo, and prawns and rice and vegetables and wow, yum. This was good. By this point you've probably guessed that the entire clientèle was...yup, tourists. Still, there was beauty in listening to 6 or 7 different languages floating above the sound of the waves, eyes in soft focus on the cloudy and exquisite sunset...which gave way to a skyful of stars mirroring the twinkling lights of the surrounding cities. Simple, beautiful. Tonight, fly from Bali to Singapore. Land early tomorrow morning (12:45am). Four days in Singapore with Joe! Sunday fly to Phnom Penh, Cambodia. Hanging there for a few days. Then, more "I don't know." I promise to post photos and substantive updates soon.